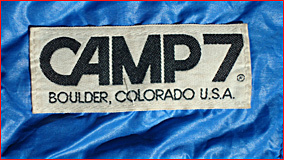 Mr. Lamb was a gear pioneer who did work for several of the early pioneering companies from the Boulder area. References put him connected with GERRY and Holubar, and also with Wiggys....Like the founders of most of the other Boulder pioneering companies, Mr. Lamb was a climber in his own right; one of his most memorable ascents was a first ascent of the Pigeon in the Bugaboo Mountains of Canada. Also worth checking are the Alpine Designs and Alp Sports pages.